Site with former filling station, agricultural buildings & adjacent ground. Further ground available by sep neg. Price over £225,000 Entry by arr. Viewing contact solicitors. We are pleased to offer for sale on the open market this substantial site comprising the disused former Rhynie Filling Station together with adjacent ground, Agricultural Buildings and ground to the rear. The site enjoys an excellent location off the Main Street of the village of Rhynie. Directions - Travelling from Aberdeen or Inverness take the A96 main road to Huntly and at the roundabout leading into the Town turn along the A97 towards Rhynie/Lumsden. 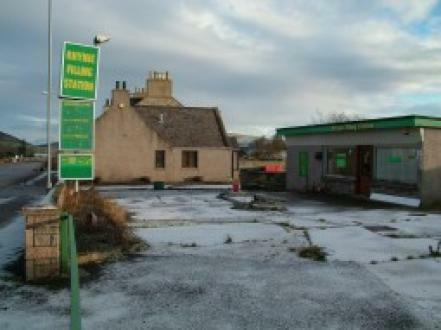 On entering the village of Rhynie the former Rhynie Filling Station is located on the left hand side. A location plan showing the approximate area of the site is attached to these particulars. Location - The site is located in the village of Rhynie which is a small vibrant community with its own shop, tearoom, church and Primary School. Many popular local events take place through out the year including the well attended Rhynie Gala which draws in people from the surrounding areas. Rhynie recently featured on the Beechgrove Garden with a community project involving many local residents. Huntly the nearest Town is located approximately 9 miles distant and has a wider range of amenities. It is a prosperous market town on the main A96 road approximately 39 miles from Aberdeen and 59 miles from Inverness. The town is within easy commuting distance of Aberdeen. The town is a popular tourist centre during the summer months, giving easy access to the Grampians, Cairngorms, Royal Deeside, Strathdon and the Moray Firth. There are a wide range of Shops, Educational Establishments, Churches, Hospital and Sports Facilities (including golf, fishing on the rivers Deveron and Bogie, bowling, cricket, and many more). Planning - The site is offered for sale without the benefit of Planning Permission. It is being "sold as seen" and any potential purchaser will require to clear the site and deal with any contaminative issues. It is recommended that potential purchasers make their own preliminary enquiries as to the acceptability in principal of development of the site with Aberdeenshire Council Planning Department. Access - Access is from Main Street, Rhynie and any potential purchaser will require to consult with the Local Authority regarding access issues. Water -Mains water is available on site but consultation with the Local Authority will be required if development is considered. Drainage - Drainage is available on site but similarly consultation with the Local Authority will be required to ascertain the position for development. Electricity - Mains Electricity is available on site but any purchaser will be responsible for making preliminary enquiries with the power companies. Viewing - STRICTLY by arrangement with Subscribers only. Entry - Early entry is available. Price Guide: Over £225,000 for the site. Further ground is available by separate negotiation. The Subscribers, as Agents for the Seller, may fix a closing date for offers in respect of which they will notify all parties who have noted an interest with the Subscribers. The Seller reserves the right to accept any offer prior to such closing date and no responsibility will be accepted for expenses incurred by prospective purchasers in the event that the property is previously sold, let or withdrawn.